Macroeconomic theory and policy: How the closed economy was opened (P.B. Kenen). Asset markets, exchange rates, and the balance of payments (J.A. Frenkel, M.L. Mussa). The specification and influence of asset markets (W.H. Branson, D.W. Henderson). The specification of goods and factor markets in open economy macroeconomic models (N. Bruce, D. Purvis). Stabilization policies in open economies (R.C. Marston). Exchange rate dynamics (M. Obstfeld, A. Stockman). Empirical studies of exchange rates: Price behavior, rate determination and market efficiency (R.M. Levich). Income and price effects in foreign trade (M. Goldstein, M.S. Kahn). Empirical studies of macroeconomic interdependence (J.F. Helliwell, T. Padmore). 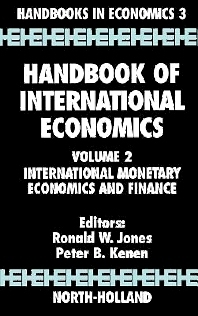 International money and international monetary arrangements (S.W. Black). Economic interdependence and coordination of economic policies (R.N. Cooper).